Back in 1966, Mr. Walter F. Masters, an Alexandria resident who owned land on Reynoldsburg-New Albany Road in Plain Township, recognized there were no recreational facilities for the young people. He and his wife, Bertha, decided to donate two parcels of his adjoining property (4.9 acres) to Justeens Incorporated, a non-profit corporation. According to their Articles of Incorporation dated July of 1964, the purpose of the Justeens was “to develop themselves mentally, physically and spiritually by wholesome recreation, service to others, building leadership and initiative, encouraging friendly relationships with others regardless of race, color or creed”. At that time, the officers of this committee were made up of Charles Krallman, Chairman, Ray E. Lordier, Treasurer and Audrey Snedecor, Secretary. The property was mortgaged for $26,000 to construct the pool facility. The original pool was installed by the Patterson Pool Company and was considered the “Cadillac” of pools and had a state of the art gutter system that recycled contaminates through the filtration system. In the Agreement, Mr. Masters had a clause that would return the property to his family if the Justeen’s were no longer able to operate the pool. And later, when there were financial difficulties, Mr. Masters in his upper years now, asked his daughter Verla, if she had any interest in the property. She said she did not and in November of 1981, the Plain Township Trustees (Cecil A. Thatcher, James F. Byrnes and Roy D. Mason) passed a resolution to take over physical control of the premises. At that time, the officers of the Justeen Organization was Patti Calvert, President, Ray Yorizzo, Vice President, Tom Marasek, Secretary and Terry Myser, Treasurer, Don Shoemaker, Trustee, Gale Schaile, Trustee and Anita Barron, Trustee, Betty Grunkemeyer and Mary Ellen Norris (McKinny). Other members of the Justeens were Mr. Fred C. George, Mrs. Martha O’Neal, Mrs. Sally Ratchford, George M. Wolfe, George W. Fisher, Luther Norris. Alice Scott, and Betty Mulbay. Following a determination and authorization by the prosecuting attorney’s office, the property was transferred with the understanding the pool and property would be administered under a proposed joint recreational district. The sum of $15,000 was paid from the general fund of Plain Township to pay off the remaining mortgage, various bills and salaries for the Justeen Swim Club. On January 1, 1982, the transaction was completed and in a final matter, a Bill of Sale was given to Plain Township whereby they received all tangible personal property for the sum of one dollar. Those items included a popcorn popper, French fryer, hot dogger, crock-pot, milk shake machine, snow cone machine, cash boxes, time clock, bullhorn, gas mask, lawn mower and odds and ends. The Justeens were dissolved in February of 1982. Plain Township operated the Pool from 1982 until 2000 when the Trustees passed a resolution to discontinue operations of the outdated pool facilities, ending 34 years of recreational swimming for local residents. Through a recent land trade with the New Albany Company in which they traded 7.5 acres for the old pool site and a donation of $700,000, we are able to continue Mr. Master’s vision of providing a new state-of-the-art recreational aquatic center featuring 3 pools to the families of New Albany. The groundbreaking for the Plain Township Aquatic Center on May 29, 2002, opens a new beginning with a state of the art aquatic facility being constructed to meet the needs of our fast-growing community. For several years, Plain Township has been in the planning stages for a new swimming facility for New Albany to replace the old and outdated pool facility on Reynoldsburg-New Albany Road. Through a trade of our old property in exchange for donated land by the New Albany Company, LLC, the Township has closed on a deal that has given us 7.5 acres on which to plan a new swimming facility. This parcel is part of a 45-acre parcel, which will include a new school and a recreation complex. The pool site is located just off Fodor Road between the High School and Tim Horton’s/Wendy’s at 7650 Swickard Woods Boulevard. The planning began with a comprehensive feasibility study and a resident survey conducted to clarify the goals. Moody/Nolan Ltd. Inc. conducted the Plain Township Outdoor Pool Feasibility Study in June of 2000. The planning process was community based, involving a core planning committee of seven residents, a New Albany Company representative and the Township Administrator. Their primary concern was that the new pool meets the current and future needs of our fast growing community. A business plan was included based on demographic information. Typically nationally and locally, family aquatic centers recoup substantially more than their annual operating costs and it is expected that the pool will recover direct and indirect costs depending on the fiscal policy of the township and its potential partners. 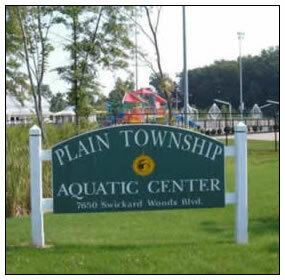 In January 2001, Plain Township Officials hired a Cleveland firm, to conduct a telephone survey in the Plain Local School District to determine the overall level of interest in the community for a new family outdoor aquatic center. The project also aimed to assess the support for, and viability of, various funding options. Interviews were conducted to include 300 respondents from the Plain Local School District. A summary of those interviews resulted in more than half of the residents said they would use the new pool, as the old pool was inadequate. Concerns were how the project would be funded and fear of a tax increase. The survey included categories about current levels of satisfaction, the need for a new facility, users of the facility, funding and bond options, memberships and other general information. The consensus was that most residents wanted a new community outdoor pool and aquatic center. On March 7, 2002, Plain Township took ownership of the 7.5-acre parcel and immediately began the process to construct the pool. The firm of Wandel & Schnell, Architects, Inc. was selected to design the new aquatic facility and the construction contract was awarded to Contrak Corporation Construction Services. The official groundbreaking ceremony was held May 29, 2002 in conjunction with the New Albany Plain Local School District. While the Township, the architect and the contractor were committed and focused on the completion of the new pool for the summer of 2002, progress had been held up by weather, revisions and some delays in obtaining the necessary permits. Construction continued into the cold months of November and December. Patterson Pools continued to work in the pump house completing the necessary welding and set-up of pumps and filter systems. The Grand Opening was held May 24, 2003, Memorial Day weekend to many enjoying this wonderful state-of-the-art aquatic facility to our community. The Aquatic Center is now beginning its 11th year, having grown in revenue, membership and pool visits. Our largest age group is ages 4-9 years old. Gross pool receipts have steadily climbed. Expenses are more complicated to manage with unexpected repairs and maintenance however the pool has managed to sustain itself from year to year without using any general fund monies. We provide a great swim lesson program, sponsor the Plain Township Swim & Dive Team and hold special events. Our future plans would be to add a “sprayground” feature for the younger children and also a storage building for pool equipment.